Goldendoodles! A mix of all our favorite breeds. Just like Neapolitan ice cream. These gorgeous dogs are obviously a mix between Golden Retrievers and Poodles (often with a bit of Cocker Spaniel thrown in). They come in Toy and Miniature Goldendoodles following on from their poodle parent’s size. If you are interested in more in-depth information about how Goldendoodles are bred and their different types, watch this video for all the details you need. Also known as “Groodle”. This is not a hunting dog even though its ancestors tended to be used for hunting. They like to take long walks each day and to swim when given the opportunity. Such activities are required to keep it physically and mentally fit. Goldendoodle puppies were first bred in the 1990s in Australia and North America when golden retrievers were crossed with standard poodles. Next came their Miniature and Toy Poodle cousins, bringing about the so-called Teddy Bear Goldendoodles. These were initially bred as an alternative to the Cockapoo (Cocker Spaniel cross Poodle) with a goal of developing a dog that could guide blind individuals with allergies. The Goldendoodle usually has a curly or at least a wavy coat of about two or three inches in length. The hair is longer on the ears, body and tail making them adorable pets. The legs may be feathered and the hair on their head can be a bit shorter and straighter. The color of a goldendoodle’s coat can be very different. It can be champagne, golden, red, apricot, copper, black, ultra cream and a mix of these colors. Goldendoodles are friendly and connect to anyone and everyone. As such they are an excellent family dog. They are extremely outgoing and make for an excellent companion for walks. Their personality traits are generally smart, affectionate, gentle, trustworthy, trainable and cheerful. I’ve found they also like chocolate so try to not leave your half-eaten Snickers lying around! Goldendoodles always want to please the people around them. They get along with other pets too. As such, they do require affection, attention and time in order to be happy. This also means that if they are left alone for a extended periods they may change their behavior in a negative way. Goldendoodles have a lot of energy and are very active. They can be included in many types of physical activity, such as hide-and-seek, agility, flyball, fetch-and-retrieve and other games. A tennis ball is immediately their best friend. Thankfully they are not hunting dogs, even though their Poodle and Golden Retriever ancestors tended to do so. 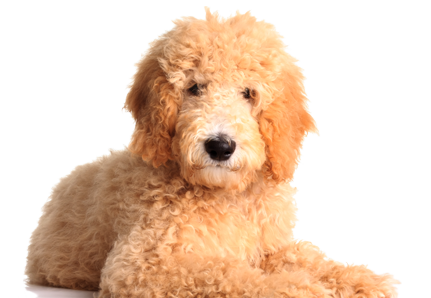 The Golden doodle’s size is measured as standard, miniature and petite (toy) and is determined by their height. Only Miniature and Toy Goldendoodles are considered teddy bear dogs. A Petite (Toy) Goldendoodle’s height is between 11 and 13 inches (28 to 33cms) and its weight between 10 and 30 pounds (4.5 to 13.5kgs). A Miniature Goldendoodle’s height is between 16 and 19 inches (40 to 48cms) and its weight is between 15 to 35 pounds (6.8 to 8.6kgs). The average life expectancy of a Goldendoodle is 10 to 15 years. A dog that is taken care of well, is on a good diet and receives the appropriate amount of exercise can live even longer. Goldendoodles have a unique look. Their curly coat derived from the poodle combined with their penetrating eyes make them immediately lovable. They are extremely friendly, intelligent, brave and extraordinarily cute!